Sodium is the most abundant cation in the extracellular fluid. Serum sodium with its accompanying anions accounts for most of the osmotic activity of the plasma. Serum sodium and osmolality are controlled by two separate but related systems. Serum sodium is maintained by a feedback loop involving the kidney and adrenal glands. A decrease in serum sodium concentration or in blood pressure results in the release of renin by the kidney. Renin catalyzes the conversion of angiotensinogen to angiotensin I, which in turn is converted to angiotensin II by angiotensin converting enzyme in the lung. Angiotensin II stimulates the distal convoluted tubule in the kidney to retain sodium and water, thereby removing the stimulus to renin secretion. Serum osmolality is maintained by a feedback system involving the hypothalamus, pituitary gland, and the kidney. An increase in serum osmolality is sensed by osmoreceptors located in the anterior hypothalamus resulting in release of antidiuretic hormone (ADH) from the posterior pituitary gland. ADH acts on the distal nephron to cause retention of water, which reduces serum osmolality and removes the stimulus to ADH secretion. Conversely, a decrease in serum osmolality inhibits ADH release, and excess water is excreted in the urine until serum osmolality returns to normal. Hyponatremia is the most common electrolyte abnormality in hospitalized patients and is defined as a serum sodium concentration less than 135 mEq/L. Symptoms are due to the relative excess of water that results in overhydration of cells. The severity of symptoms depends on the degree of hyponatremia and the rate at which it develops. A patient with mild hyponatremia (sodium >125 mEq/L) may be asymptomatic or experience malaise and nausea. As the hyponatremia worsens, headaches, lethargy, confusion, and a decreasing level of consciousness may develop. Seizures and coma usually occur only if there is a sudden decrease in sodium to less than 120 mEq/L. Hyponatremia can be categorized by its effect on blood volume. The initial evaluation of hyponatremia should include measurement of plasma osmolality, electrolytes, glucose and BUN. When serum osmolality is reduced, the next step is to determine the extracellular fluid volume of the patient. If it is reduced, hyponatremia is defined as depletional. The patient has lost sodium and water, and the sodium loss is proportionately greater than the water loss. Measurement of urinary sodium concentration helps to identify the site of sodium and fluid loss. 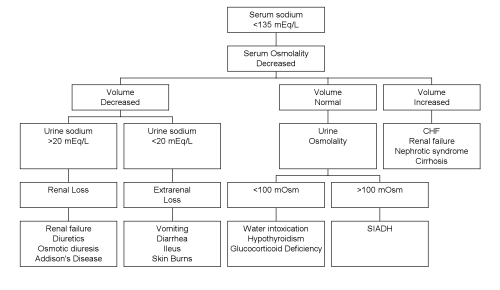 Urinary sodium concentration greater than 20 mEq/L indicates renal loss of sodium while urinary sodium concentration less than 20 mEq/L indicates extrarenal loss. The most common causes are thiazide diuretics; prolonged vomiting or diarrhea; third spacing of fluids secondary to burns, pancreatitis or trauma; potassium depletion, and aldosterone deficiency. Euvolemic hyponatremia is the most commonly encountered sodium disorder in hospitalized patients. It typically indicates a problem with water balance. The most common etiologies are inappropriate ADH secretion, severe hyperglycemia, polydipsia, adrenal (cortisol) insufficiency, and pregnancy. The syndrome of inappropriate ADH secretion (SIADH) is the commonest cause of hyponatremia in hospital patients and is associated with malignancies, pulmonary disease, CNS disorders, and HIV infection. Hyponatremia is common after surgery and is characterized by high levels of circulating ADH. Hyperglycemia accounts for 15% of hyponatremia in inpatients. Plasma sodium falls by 1.6 mEq/L for every 100 mg/dL increase in plasma glucose. Drug induced hyponatremia can be caused by drugs that stimulate the release of ADH or potentiate its action. Drugs causing hyponatremia include psychoactive agents (fluoxetine, sertraline, thiothixene, haloperidol, and amitriptyline), some anti-cancer agents (vincristine, vinblastine, and high dose cyclophosphamide), and carbamazepine, bromocriptine, lorcainide, chlorpropamide, and IV vasopressin. Hypervolemic hyponatremia is nearly always a problem of water overload, which causes edema. Total body sodium is increased, but total body water is increased even more. The most common causes are congestive heart failure, cirrhosis, advanced renal failure, and nephrotic syndrome. In congestive heart failure, impaired perfusion of the kidney causes retention of sodium and water, with water retained in excess of sodium. In renal failure, the impaired kidney is unable to excrete normal amounts of water. Hypoalbuminemia due to cirrhosis or nephrotic syndrome decreases oncotic pressure and causes water to leave the intravascular space, resulting in decreased blood pressure. Homeostatic mechanisms lead to retention of water in the extracellular fluid compartment. Pseudohyponatremia is an artifactual hyponatremia most commonly caused by severe hypertriglyceridemia (>1500 mg/dL), or less often, by severe hyperproteinemia (>10 g/dL). Sodium is most commonly measured with an ion specific electrode (ISE). Two types of ISE exist; indirect and direct. Sodium is dissolved only in the water portion of plasma. When triglyceride or protein levels are extremely high, they occupy more space in a given volume of plasma, resulting in a decreased in the percentage of water with its sodium content. Consequently, an artifactually low sodium concentration is obtained because less sodium is present in a given volume of plasma, even though the concentration of sodium in the water phase is unaltered. Pseudohyponatremia can occur when sodium is measured with an indirect ISE, which is the method used by most automated chemistry analyzers. This phenomenon is not seen when sodium is measured with an instrument that uses direct ISE, such as point of care instruments and blood gas analyzers. These instruments use whole blood, instead of plasma, and do not require predilution of the sample. Pseudohyponatremia can be confirmed by measuring sodium on an instrument using direct ISE and also measuring serum osmolality and comparing the result to a calculated osmolality. In a patient with hyponatremia, an increased osmolal gap suggests the presence of pseudohyponatremia. Hypernatremia is far less common than hyponatremia. Patients at highest risk include infants, elderly patients, patients with altered mental status, uncontrolled diabetics, and hospitalized patients receiving hypertonic infusions, tube feedings, osmotic diuretics, lactulose, or mechanical ventilation. Hypernatremia always reflects a hyperosmolar state so CNS symptoms are prominent. The signs and symptoms include; altered mental status, lethargy, irritability, restlessness, seizures, muscle twitching, hyerreflexia, spasticity, fever, nausea, labored respiration, and intense thirst. In adults, a plasma sodium level above 160 mEq/L is associated with a 60 to 75% mortality. Hypernatremia usually results from excessive loss of water relative to sodium. Loss of hypotonic fluid may be secondary to kidney disease or profuse sweating or diarrhea. The renal concentrating mechanism is the first line of defense against water depletion and hyperosmolarlity. Thirst is an important backup defense. Measurement of urine osmolality is helpful in evaluating the cause of hypernatremia Urine osmolality is normal or low after renal loss and increased after extrarenal losses. Patients fall into three broad categories. Sodium levels above 160 mEq/L are unusual and may be due to a preanalytical error. Vacutainer tubes containing a sodium based anticoagulant such as sodium heparin, sodium fluoride, sodium citrate, or sodium EDTA can markedly elevate plasma sodium levels. Cardiac patients whose specimen are collected from catheters containing benzalkonium heparin can also have falsely elevated heparin levels. Reference range is 134 - 144 mEq/L.Sodium concentrations <120 mEq/L or >155 mEq/L are considered critical values.